Curtis Hale’s current exhibit at the Northeast Kingdom Artisans Guild Backroom Gallery is divided between paintings of South Korea, where he was apprenticed to painter Lee Jae-Hyo, and paintings of his home turf, Vermont. His renderings of both locales present lushly brushed skies billowing over moody landscapes. In his artist’s statement, the Danville-based Hale further categorizes his works as early, looser pieces; travel paintings from Asia; recent compositions that sometimes flatten space and simplify landscape elements into blocks of color; and new paintings of childhood haunts. Despite these disparate-sounding elements, the show is cohesive — the artist’s distinctive hand is clear in each of the works. Hale was one of 10 artists selected for the Vermont Arts Council’s Art of Action project that concluded its yearlong, statewide tour this summer. His paintings — of steel bridges, crystalline skies and placid waters — revealed his facility with the medium. In the Northeast Kingdom show, Hale considers both familiar and foreign terrain. All of these works seem like dual portraits: the artist painting the landscape, and simultaneously painting his own sense of ease or displacement within it. In “Intersection,” a volume of dark clouds builds into the upper left corner of the painting, pressing down on the scene below. A gash of white clouds and blue sky occupies the middle third, contrasting with the dark horizon. A pewter-blue street meets a crossroads under the muddled eye of a red stoplight. To the right, low buildings skulk; a two-toned gas station with a peaked roof and a collection of parked cars sits close to a geometric, beige building, perhaps a defunct garage, that hangs back from the road. Its windows are hollow black rectangles. The composition is strong. A streetlight’s verticality and angular shape connect the darkness of the foreground to the whiteness of the clouds along the horizon, anchoring the former while drawing the eye back to slack power lines along the looming horizon. Painted in a nuanced palette of moody grays and blues, “Intersection” conveys the vacancy of an early morning in rural America. Across the intersection, the dusty yellow high beams of an oncoming car inject a human presence into the painting. Hale clearly knows this landscape; you can imagine him sitting out there, painting before dawn and attempting to see a well-worn scene anew. Hale’s South Korea paintings, on the other hand, recall the emotional freight of Robert Frank’s photographs in his book The Americans. Frank immigrated to the United States in the late 1940s and began shooting the pictures for his book in the mid-’50s. The images are simultaneously complex and bare — a clear eye into a layered world that the artist seems to discover anew. Hale’s paintings of South Korea hum with the same kind of excitement. In “Rainy Season I (building), South Korea,” painterly expanses of color seem stitched together. A periwinkle road sweeps the viewer into the foreground before snaking around a field to the left. To the right of the road, telephone poles pace methodically into the distance, past a cinder-block house with just one small window. New-looking roads and a wall of cliffs appear in the background. An angular gray building hunkers low against the cliffs, a contrast to the gestural curves of the wooded terrain. Hale’s fresh yet muted palette of steely gray, warm greens and subtle sienna echoes the early-morning sensibility of “Intersection,” yet here, each stroke seems like a discovery. With the wide-open eyes of a first-time visitor, he appears to have taken in every subtle shift in the scene and recorded them vividly, without interpretion. This is Hale’s gift: He sees. His paintings of Vermont and South Korea hang together companionably, each with an artistic honesty that truly is worth a thousand words. 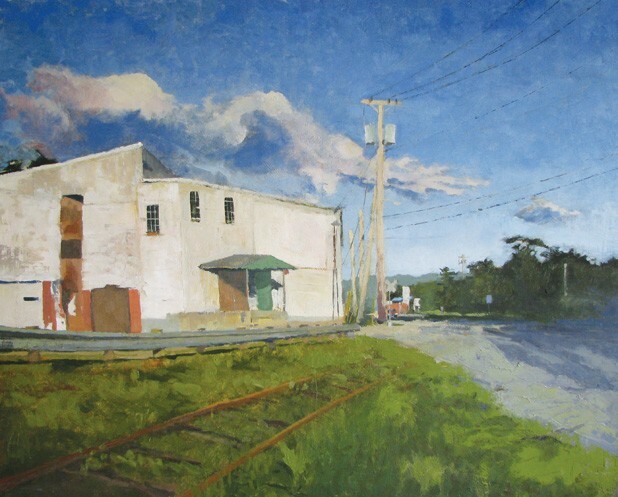 Curtis Hale, “Landscapes Near and Far,” Northeast Kingdom Artisans Guild Backroom Gallery, St. Johnsbury. Through September 28.